The practice of both Kung -Fu and meditation affords an opportunity for physical, mental and spiritual development. In Kung-Fu this development is accomplished through vigorous physical exercise, discipline, skill development co-operation among students and the guidance of a qualified instructor who exemplifies the true philosophies of the martial arts. The advanced Kung-fu student is characterized by self-control, a co-operative, respectful attitude and a peaceful disposition. In the following paragraphs I will endeavor to show that Kung-Fu and meditation are compatible and mutually beneficial- that both bring a state of peace and harmony to the practitioner. There are many forms of meditation. Examples include fixing the gaze at a point for long periods, focusing on the breath, repeating a word or phrase (mantra), Consciously directing the movement of energies in the spine, focusing on an internal light or sound, and focusing on movement such as walking or dancing. The oldest techniques still practiced today were evolved thousands of years ago by sages in India as methods of spiritual development. For the purposes of our discussion, meditation is referred to in general rather than in any of its specific forms. One important aspect of meditation is the development of proper breathing, which energizes the body with oxygen, expels impurities and releases tensions. A state of health, increased energy and calmness results. Proper breathing is a key to all Zen arts and sports. 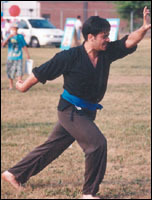 Breathing exercises are also practiced in Kung-fu training. The restless mind can be compared to a radio in which the transmission is disrupted by static. Meditation tunes out the static so that we can send clear messages by concentration and clearly receive information through increased awareness or intuition. In our normal activities the mind is involved with the body, and the sense continually send sensations to the brain. In the stillness of meditation, consciousness gradually withdraws from the senses and becomes concentrated in the central nervous system. In this interiorized state the mind is able to focus at one point without the distraction of the senses. Apart from the benefit of increases concentration and awareness the adept mediator experiences peaceful and joyful states in meditation. Such a mediator typically finds greater peace and satisfaction in performing all daily activities. Also, a sense of connection with all other people and harmony with nature develop as the result of increased intuition. The practices of Kung Fu and meditation are mutually beneficial. A healthy, well-exercised, strong body developed through the practice of Kung-Fu enables a student to sit for long periods in meditation. Conversely, increased concentration and awareness or intuition developed through meditation assists in the student's development as a martial artist. Meditation teaches patience- the results rarely come quickly. As with Kung-Fu, regularity of practice is the key to success. Also, like Kung-Fu or anything worthwhile, meditation is "hard work".